Actually, the topic was long since over and done with. Mosaics are past their due date, and their last heyday was somewhere between the 1950s and 1970s: as counter-tops in milk bars and Italian ice-cream parlors, as art on the sides of buildings as with the frieze on the "Haus des Lehrers" on Berlin's Alexanderplatz. After that, hardly anyone wanted anything to do with the musty topic. Yet at the end of the 1980s and in the early 1990s, the digital age commenced and with it the pixel's victory march. Unlike the incomprehensible bits and bytes, all hidden away in the depths of data, pixels were a visible and striking symbol of the new world of multimedia. Anyone who wanted to be on the cutting edge of the digital revolution founded a start-up that had "pixel" in its name, and sallied forth to conquer new markets. However, as soon as the digital technologies started dissecting the entire world into a myriad of individual image dots, the mosaic was also able to shed its image as being old-fashioned - in one of the numerous feedback loops from the virtual back into the real. 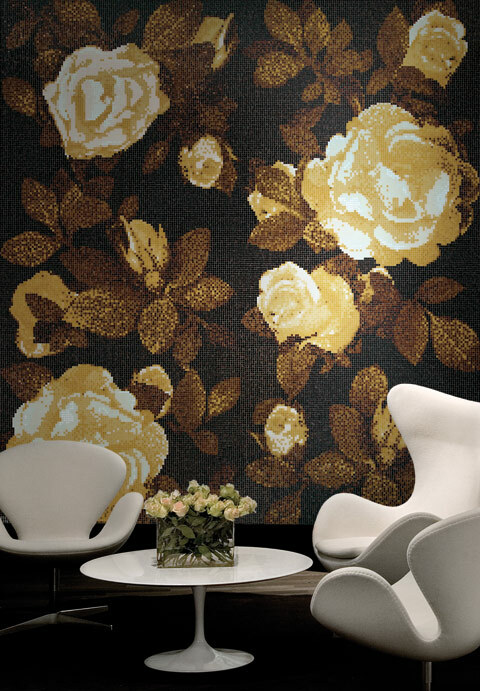 North Italian company Bisazza succeeded in highlighting the new possible applications for mosaics, in perfectly staging its own glass mosaic product in flagship stores and trade fairs, and having young designers and architects bring an old tradition into the present. 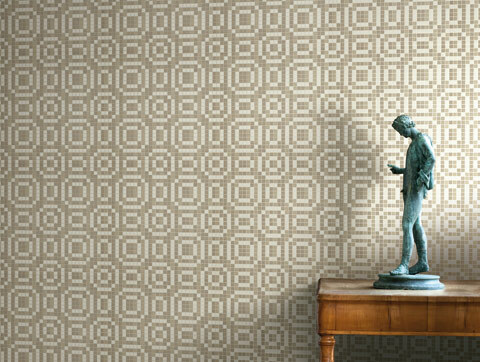 Since then, the excruciatingly expensive Bisazza tessera are a desirable original and mosaics are an issue for design. 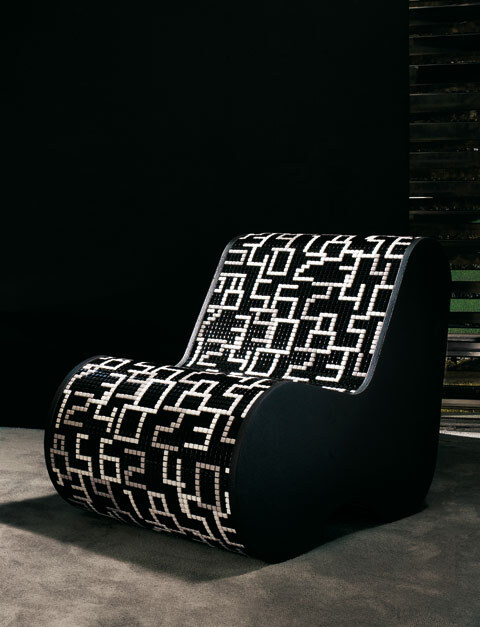 Marcel Wanders used the little stones to create colorful gravel-shaped side tables, Jürgen Mayer H. turned mosaics into an elastic material for furniture in his "Soft Mosaic". Patricia Urquiola blew them up to forge traditional decors for room dividers, Andrée Putman coated the underside of a desk with them, and Jaime Hayon covered vases and even airplanes with them. Over the past one or two decades, the coarse grid and the surfaces, dissolved into their individual parts, have become an expression of contemporaneity in many walks of life: For example, in the work of architects such as Sauerbruch Hutton, whose facades are composed of countless color fields, for parquet floors that consciously utilize a mixture of different woods, in the "Sushi" armchair the Campana brothers designed for Edra, which consists of a twisted skein of rags, in Shay Alkalay's "Stack" shelves for Established & Sons, which is made up of stacked colored drawers, for carpets that seem as though they are composed of hundreds of sticks of licorice or for tiled walls in Dutch cafés, that only from a distance jell to form the portrait of Queen Beatrix. Architecture and design have rediscovered the complexity and depth of materials and the beauty of small parts as a response to the purported smoothness and two-dimensional state of the virtual world. The principle of homogenous surfaces has given way to the principle of heterogeneity, which stands for diversity, personality and uniqueness. 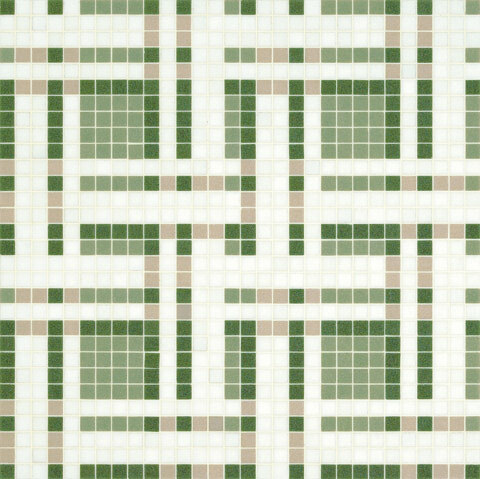 The mosaic's small-sectioned aesthetic was swiftly caught up in the mainstream: No temple of wellness without glass mosaics, no design hotel without a Bisazza bath, no DIY store that does not offer several cheap versions of Bisazza. 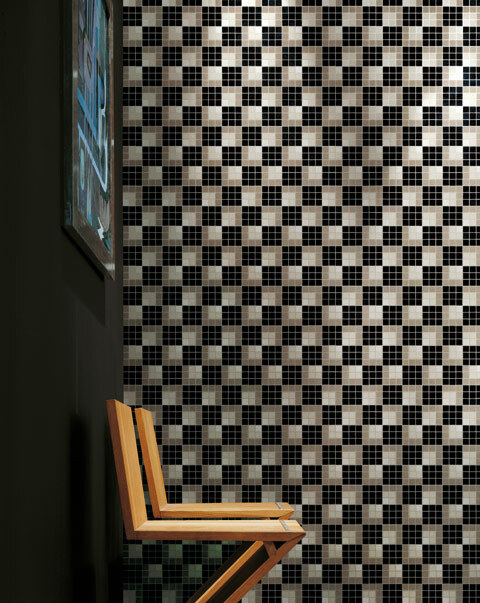 The Bisazza wall has become a theme in interior design in its won right, just as Mies' onyx wall did, or the omnipresent pointed ashlar walls of the 1960s. They are dashes of color that provide vibrancy and a textured surface, bringing a bit of material life into otherwise sterile surroundings. And in many cases they are merely the "instant decoration" from which even dead environments hope to gain a small breath of new life. And the pixel has long since found its progressive image becoming tarnished: The Pixelpark corporation now also stands for the burst dot.com bubble. Consumers have learned to live with the pixel errors in monitors or digicams. And the once so proud professional cachet of web designer has, like the office workers who are only pencil pushers, turned into that of pixel pusher. Yet the pixel still counts as the smallest vivid unit of digital images. 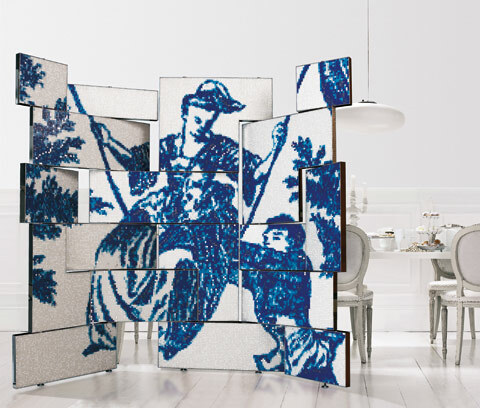 And the products that Bisazza has been so successful with worldwide still stand for a ready combination of crafts tradition and digital aesthetic. They link the two-dimensional structure with the material's depth. Their small parts stand for crafts and tradition, just as they do for the fractal and the molding of small units into metastructures that evidently better depict the complexity of the present than do the homogeneous surfaces and the closed shapes that for decades were considered the epitome of the Modern. 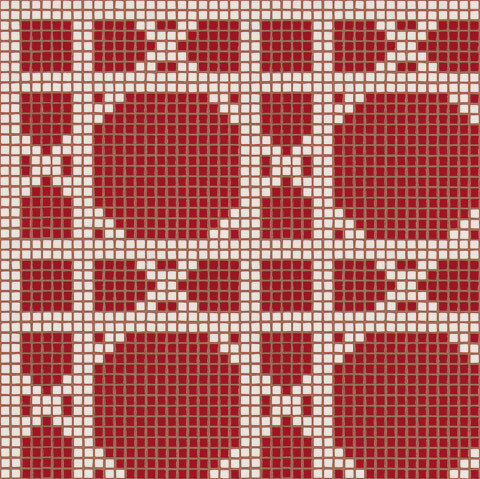 The playful use of patterns in mosaics has helped overcome the cliché of a smooth and aseptic "design aesthetic" and make décor once more a theme for designers to tackle. 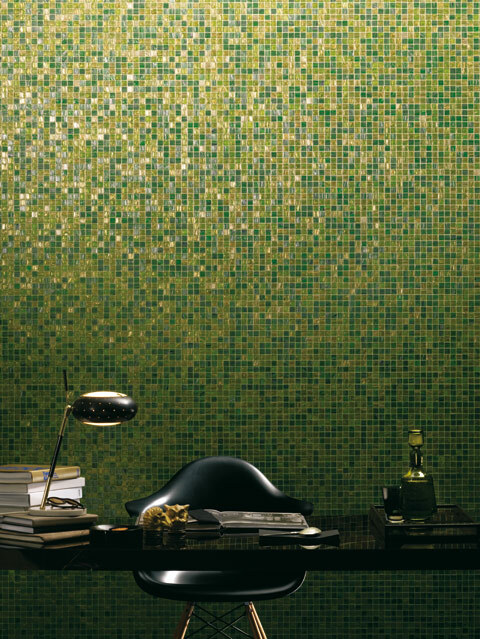 In fact, "Bisazza" has almost become synonymous with glass mosaics. As long as the Italians succeed in keeping the topic contemporary and get designers who love experimenting to come up with surprising solutions, the fascination for the rediscovered world of mosaics will remain - after all, it existed a few thousand years before pixels.